The First Battle of Kut, begun on 5 April 1916, marked the final British attempt to relieve the Turkish siege of Sir Charles Townshend's beleaguered 10,000 troops garrisoned at Kut. Its failure sealed the fate of Townshend's force which, at last out of supplies, surrendered unconditionally to Turkish commander Khalil Pasha on 29 April 1916. In charge of the operation to conduct the relief was the newly arrived (and resolutely unpopular) British commander George Gorringe who took over from the recalled Sir Fenton Aylmer. Gorringe's force was boosted by the recent arrival of Sir Frederick Maude's 13th Division. This brought his available strength up to around 30,000, a figure matched by Khalil's decision to draft up reserves from nearby Baghdad. Gorringe decided to open the attack by sending Maude's men against the Hanna Defile once again, in spite of the earlier failure in storming the same position in January 1916. In the interim however Khalil had taken the opportunity of establishing two deep trench lines at Fallahiyeh and at Sannaiyat. Attacking at dawn on 5 April Maude was surprised to discover the Turkish first line unoccupied. He therefore regrouped preparatory for a frontal assault upon Fallahiyeh that same evening. Fallahiyeh was duly taken following an advance across mud-soaked terrain, but at heavy cost. Meanwhile a secondary attack along the other bank of the Tigris River encountered relatively light opposition. With Fallahiyeh secured reserve forces were set in place in readiness for a follow-up attack against Sannaiyat the next morning. Despite these early promising British successes casualties were nevertheless uncomfortably high: 2,000 on the first day alone. Progress was much more difficult to come by on the following morning. Attack after attack upon Sannaiyat was repulsed over succeeding days. 1,200 British casualties were incurred alone on 6 April, with additional losses suffered the next day and on 9 April. Frustrated in his attacks against Sannaiyat General Gorringe resolved therefore to switch the focus of his main attack to the other bank, against the Turk-held Bait Asia position. Heavy rainfall however hindered Gorringe's advance. Nevertheless forward Turk positions fell on 15 April with Bait Asia itself falling on 17 April at relatively light cost. Khalil launched a determined counter-attack with 10,000 troops overnight against Bait Asia's Anglo-Indian forces but was ultimately thrown back. Khalil's force suffered a high percentage of casualties: 4,000; however the British loss of 1,600 troops made further progress along the bank virtually impossible. 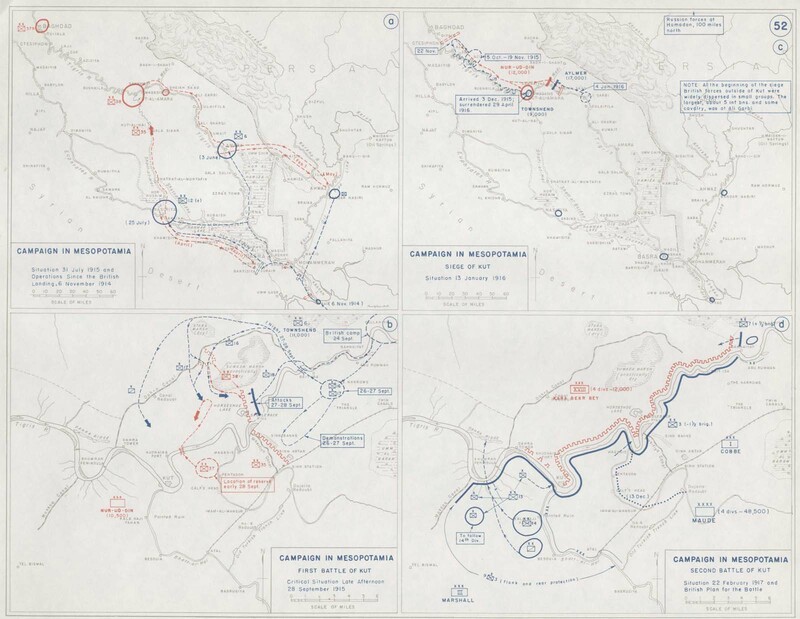 Despite the absence of around 5,000 reserves en route to Gorringe from the British HQ at Basra, General Gorringe nevertheless launched a final attempt on 22 April, switching his focus back again to Sannaiyat. Weakly composed however - the attack consisted of a single brigade preceded by the usual artillery bombardment (which as ever warned the Turks of impending attack) - it was repulsed after Khalil first evacuated his first two lines and then counter-attacked in force. A further 1,300 British casualties were suffered in this latest setback, bringing the overall total during relief operations to 23,000. No further attempts at relief were made save for a final, desperate effort to send supplies through to Kut via an armoured supply ship, the Julnar (which also failed). Accordingly Sir Charles Townshend, having consulted with higher authority, surrendered unconditionally on 29 April 1916 having failed to purchase parole for his 10,000 men with a £1 million offer. It was the greatest humiliation to have befallen the British army in its history. For the Turks - and for Germany - it proved a significant morale booster, and undoubtedly weakened British influence in the Middle East. In the wake of what was perceived in London as a calamity Maude replaced General Gorringe as commander of the so-called Tigris Corps in July 1916, marking a shift in control from India to Britain. The following month he was given responsibility for the entire front. He immediately set about reorganising and re-supplying British and Indian forces in the region. He rapidly established a reputation as the most successful commander - of either side - operating on the Mesopotamian Front.